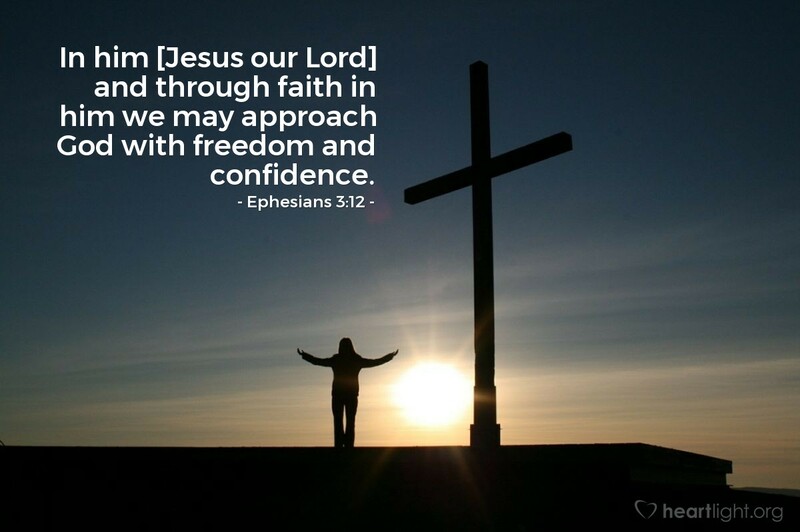 In him [Jesus our Lord] and through faith in him we may approach God with freedom and confidence. In Christ we are given so many freedoms — freedom from law, sin, death, etc. But one of the greatest freedoms we have is to boldly come before the Creator of the universe, the God of all time and creation, and speak openly and confidently with him. Incredibly, we mortals can enter God's world with our problems and be confident that he hears us and cares about our concerns. Almighty and most holy God, I know that without your grace and attentive care my requests to you would go unheeded. But I also am confident that because I am your child, my requests matter to you. Thank you for hearing my prayers each day. Thank you for caring about my concerns. Thank you for being patient with my impatience and tender with my frustrations. Most of all, Father, thank you for the freedom to do what I have no right or power to do — to invade your world with my concerns and be welcomed by you there. In Jesus' name. Amen.